Pixar's newest animation handles some abstract concepts for youngsters dealing with emotions, memory and conflict. Directors Pete Docter and Ronaldo Del Carmen who also wrote the story with Josh Cooley and Meg LeFauve, is bright and engaging for the kiddos. The philosophical ideas of the subconscious will fare better with adults. All the other trappings in visualizing the mindscape is there for the young ones. It's funny, charming and full of surprises like nothing you have seen before. The story is about Riley (Karen Dias) who has just moved from Minnesota from San Francisco because of her father's job. Born and raised in the north, enjoying ice hockey and actual seasons, the change is challenging. We see the conflict from the perspective of her emotions. 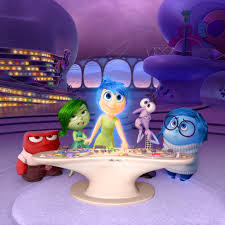 They are Joy (Amy Poehler) who guides the others like Sadness (Phyllis Smith), Fear (Bill Hader), Anger (Lewis Black) and Disgust (Mindy Kaling). They sit at a control board assessing the new experiences faced by Riley and pressing the right buttons for her to handle whatever comes her way. Memories are stored in little globe objects that are stored on massive shelves, then later deleted by “mind-tenders” if they are no longer necessary. For instance old phone numbers, or doctor appointments. The life changing memories are more precious, and they are called core memories. They are kept close at hand in case they need to support a feel good moment. Each emotion has their own agenda, but usually adhere to Joy's say so to keep Riley feeling good about herself. The new school and missing her friends has made Riley a little pensive, but she's always been a positive child. Her parents (Diane Lane and Kyle MacLachlan) keep her close and happy. Things seem fine, until Sadness for some reason she can't control touches one of the core memory globes tainting it with blue. Once a core memory is changed, there is no way to turn it back. Joy freaks out and tries to protect the other cores from Sadness and then everything runs amok. Joy and Sadness end up in the land of long term memory and it's a long way back to the control room. In the mean time Fear, Anger and Disgust are left in charge and poor Riley is doomed for a rough ride ahead. Mom and Dad have their own team of emotions dealing with the suddenly angry and withdrawn Riley. The journey of Joy and Sadness to get back is full of misadventure. They also meet Bing Bong (Richard Kind), Riley's old imaginary friend who helps them. Somewhere along the way, Joy comes to grips that even Sadness has something to contribute to Riley's well being. Not everything is hearts and flowers. It's OK to feel not only sad, but fearful, angry and disgust. Whether kids will understand the need to explore their own personal psyche's, well that's something to be discovered. What is a sure thing is the movie will delight those that see it. Not to be missed! Plus, there's the little short called Lava before the film, which is quite amazing too!